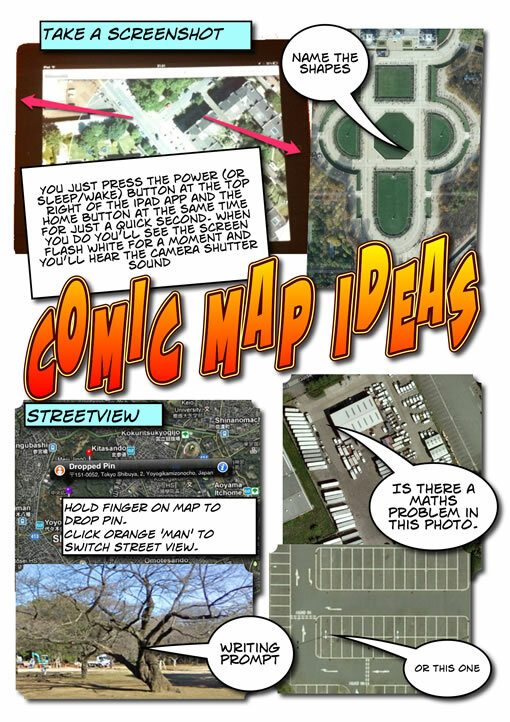 Make a comic-strip style set of instructions for a practical task. The task you choose is entirely up to you. It could be something that relates to your subject area, or alternatively you can do something more generic like starting up and shutting down a computer, how to set an alarm clock, or how to use the office photocopier. I’ve always liked making comics both with with pupils and for myself, a few years ago I made this set for my daughter when she went to university: Recipe Comics – a set on Flickr. For this assignment I decided to use ComicLife on the iPad, I’ve used ComicLife on the desktop a fair bit but not done much more with the iPad app than quickly demo it. This looked like a good opportunity. I’ve been doing a fair bit of iPad workshopping this week, and one of the things I’ve been showing teachers is some map activities. These are based on ones I’ve carried out a few times with pupils on an iPod touch. Basically taking screenshots of the maps app and using them for Maths or literacy. So the comic was made with the techniques shown by the comic. Although there has been suggested web apps for each of the edtechcc assignments I’ve used desktop applications for the first two (Fireworks, audacity) and now an iPad app. I have used web image and audio editors in the past but never found a compelling reason to use them before a desktop app other than price. I am editing this post in TextMate and will post to my blog via the MetaWeblogAPI rather than by using a browser. The problem with browser applications is with, imo, workflow and integration with other application which is not as mature as desktop or as simple as iOS. ComicLife on a mac is a good example of this, easily showing your images to ad to your comic without having to upload them. Or TextMate, here to add an image to a post I drag the image from the desktop onto the document I am typing in, it uploads it to my blog and inserts the code. I had planned to try planning a bit with pencil and paper for this assignment after watch other folk go through the notes/mind-mapping/sketching process. But again I just got started and played about as I went along. I’ve noticed my ‘planning’, if you call it that, occurs when walking, driving or doing some other activity so I have some idea of what I am hoping for when I sit down. No excuse really and I will try a bit harder on a future assignment. There was not much thought in this one anyway, I’ve stuck to ComicLife defaults, perhaps over familiar but they do the job I think. Yesterday I was at the Apple Store Glasgow opening. Fun was had by a lot of smiling people. As I mentioned I was interviewed by Mark‘s ex -piecast team The MacCast. I would guess I’ll end up on the cutting-room floor as I mumbled and probably blushed, but the questions made me think a bit. They asked about my favourite apple applications, this got me started, my favourite applications are not apple ones. Of course I use the iLife tools and would not be without them, I’ve just started using pages and keynote and like them. But some of the ones I like most come from elsewhere. Here is a wee bit about 3 of them, why I like them and what they do. A sort of 3 favourite applications after I’ve skipped past iLife, iWork, email, browsing and Web 2.0 etc. SuperCard is cousin of the old mac essential HyperCard a simple but powerful tool for building applications and scripting on a mac. SuperCard has a simple english type scripting language and can tap into the power of appleScript and unix shell calls. I use it everyday. In the past I have created fairly useful teacher and teaching tools but now I mostly use if for avoiding repetitious task. Eg. most of the gallerys on Sandaig Classes such as this one are run up with a SC project. I blog about Supercard at Bad Poet and have some resources for teachers and others on the site. Comic Life is not an application that I use everyday, but it is a great tool for children and epitomises a type of good mac application. The way it fits in with the iLife suite, making creating comics a simple task, drag and drop. By tapping into core mac ‘stuff’ the graphics, gradients and shadows are beautiful. I believe there is a windows version in the works, I’ll be interested to see if it is as slick as the mac one. TextMate is an amazing text editor for macs. I probably only use a tiny fraction of textmate’s facilities. Aimed mostly at programmers TextMate is still useful to folk like me who write a bit of html, css and occasional snippet of php, it has a ton of keyboard shortcuts to do all sorts of thing. for example if you are writing on a html document and select a bit of text and hit command-control-shift-L textmate looks up the selection on google and creates a link in your document. textMate is extensible via bundles, there are bundles for all sorts of things, different programming languages etc. I am blogging this with the blogging bundle, I can preview and post this to the blog without leaving textmate. I drag an image onto the Textmate document and it is uploaded to my blog and the html snippet inserted. you can define your own snippets, I type seb and hit tab and a link to ScotEduBlogs is created (like that). Drag a swf onto the document and the code for inserting the flash file is created. It would take months to explain everything textMate can do. So those are my 3-4 left field must have applications I would be interested in yours?